Two weeks after a rather routine victory for Lewis Hamilton at Spa, the focus shifts to another iconic F1 circuit – the fast and furious Monza, in Italy. 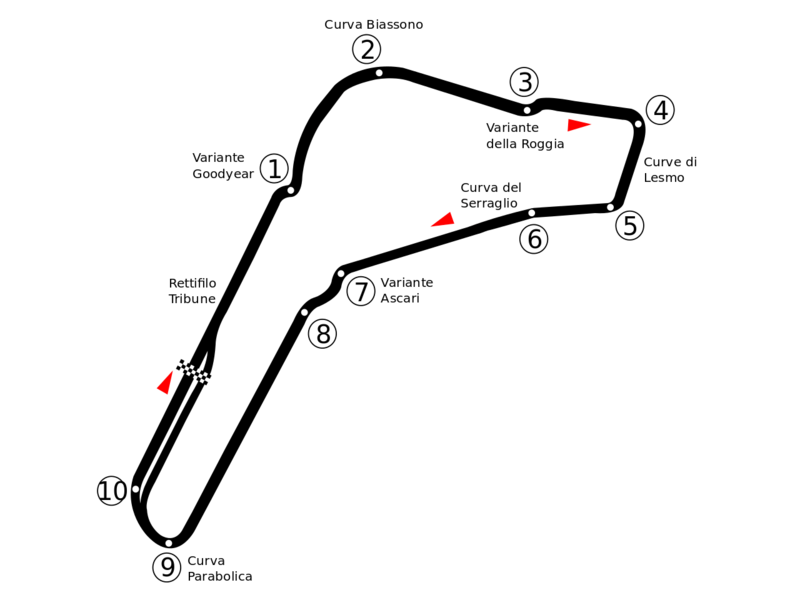 Monza has been hosting grands prix since 1921, and hosted an F1 race for the first time in the sports inaugrial 1950 season. This year’s event will mark the 65th Italian Grand Prix held at Monza, a Formula 1 record. No track can boast a faster average speed than Monza – this is hardly surprising; the layout is one made for speed, with few tight corners and plenty of straight track to hit hard. Despite this, turn 1 is a hard-braking zone, as the corner (really more of a chicane) can come up at you quite suddenly. Unsurprisingly, first lap chaos can often erupt here, as 22 cars will scream toward the corner, only to try and out-brake each other. Turn 2 can be taken reasonably quick, whilst turn 3 is another corner requiring a firm application of the brake, and turn 4 can be taken quite quickly, if you’re feeling brave (as can turn 5). It’s risky though, as it’s easy to slip off onto the grass. Turn 9 is another deceptive corner – it looks reasonably fast, but you don’t want to be too aggressive, lest you cost yourself your exit onto the main straight. It’s ironic that Ferrari (for whom Monza is a spiritual home) will come here at a potential disadvantage – whilst their 2015 car is much improved over last year’s design, and their engine has certainly gotten stronger, Monza, being a power circuit, will play into the hands of the Mercedes-powered teams. Mercedes themselves will be favourites, especially having taken a one-two finish here last season (with a few fans wondering if Rosberg was ordered to cede the win to Hamilton). Lotus (despite being on the verge of financial collapse) are expected to race here, amidst ongoing speculation regarding their future. The Renault-powered Red Bull and Toro Rosso teams will probably struggle, even their weaker engines, whilst McLaren will want this over and done with swiftly. It’s hard to look past a Mercedes one-two once again.